JASON BEAN/REVIEW-JOURNAL Bishop Gorman's Shaquille Powell runs from Armwood High School's defense during a Nationally televised football game at Fertita Field in Las Vegas on Aug. 26, 2011. Bishop Gorman’s football team took the field Friday night hoping to earn a new level of respect with a home victory before a national television audience. The Gaels won the respect, but they didn’t quite win the game. Florida powerhouse Armwood, ranked third in the nation by Sports Illustrated, held off a frantic fourth-quarter rally by No. 6 Gorman and hung on for a 20-17 win in a game broadcast live by ESPN2. Jarrett Solomon completed 13 of 20 passes for 166 yards to lead the Gaels, who rallied from a 20-3 deficit with two touchdowns in the fourth quarter. But the Gaels’ final drive fizzled in Hawks territory, and Kline Fielden missed wide left with his attempt to tie the game with a 40-yard field goal as time expired. Both defenses controlled the pace early, and the Gaels finally grabbed a 3-0 lead on Fielden’s 29-yard field goal with 25 seconds left in the first quarter. But Armwood quarterback Darryl Richardson began finding open receivers in the second, and his 66-yard completion to Alvin Bailey gave the Hawks a 7-3 lead early in the quarter. Gorman’s defense appeared temporarily stunned, and Armwood took advantage by capping an eight-play drive with a 12-yard scoring run by Wade Edwards to make it 14-3 just before halftime. Sanchez said he was not worried. But the deficit became more significant when the Hawks burned seven minutes with a 15-play drive to open the third quarter. Edwards’ 3-yard touchdown run made it 20-3, and the Gaels appeared buried. But Gorman’s passing game, which was largely ineffective in the first half, suddenly came to life on the ensuing possession. Shaquille Powell capped an 88-yard drive with a 3-yard touchdown run to make it 20-10 with 11:52 left, and Solomon scored on a keeper to cut the Gorman gap to three points with 2:53 to go. The Gaels stopped Armwood’s next possession quickly and took control at their 38-yard line with 1:55 and three timeouts left. Solomon’s fourth-down pass with less than a minute to go got Gorman to the Hawks’ 22-yard line to set up Fielden’s field-goal attempt. Armwood coach Sean Callahan said the Gaels put up a good battle. 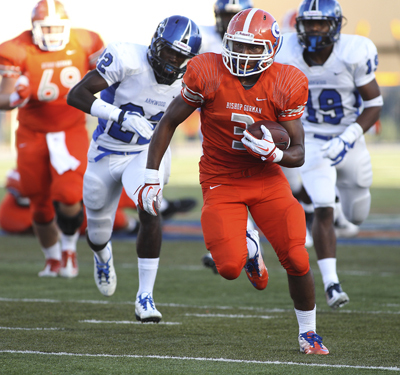 Powell rushed 16 times for 84 yards to help Gorman, and Solomon added 49 yards on 13 carries. Richardson completed 6 of 13 passes for 118 yards to lead the Hawks (1-0), with 113 of those yards being logged by Bailey.